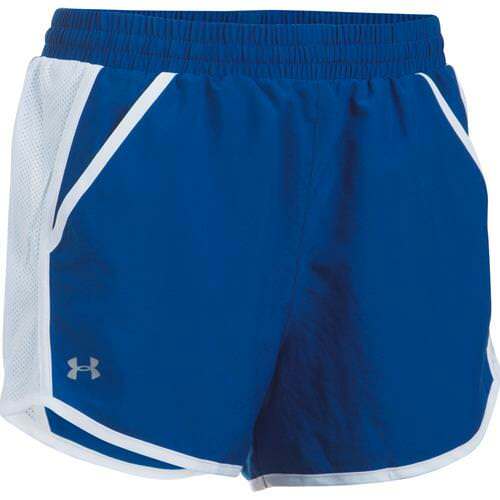 A great standard running short for casual enthusiasts and seasoned pros alike. Made of woven HeatGear polyester with wicking properties. Ultralight fabric construction with close-cut, ergonomic design that won't hold you back. HeatGear technology is especially developed for warm to hot weather. Signature Moisture Transport System wicks to keep you feeling dry, light on your feet and cool. Wide, covered elastic waistband has internal drawstring ties. Deep off-set hip pockets for secure storage. Inset ventilated mesh panels at sides for increased airflow. Sport brief liner for easy use and extra-breathable comfort. Reflective Under Armour logo on front of right leg near hem.